I was kind of disappointed that I couldn't find a pair of the leggings right off the bat because I am a huge fan of getting what I want when I want it ;-) but when I saw that Temple Flower needed some help to get into production, they piqued my interest. After viewing the video, and seeing the production process, the fashion design student in me was on board. They show how they plan to put their clothing, made with thoughtfulness and creativity, into our yoga studios (on our bodies, of course). I was the first to help Temple Flower get off the ground with their Kickstarter that starts today! Temple Flower’s goal is to raise $20,000 on the crowd-funding platform, Kickstarter, in order to move to production. 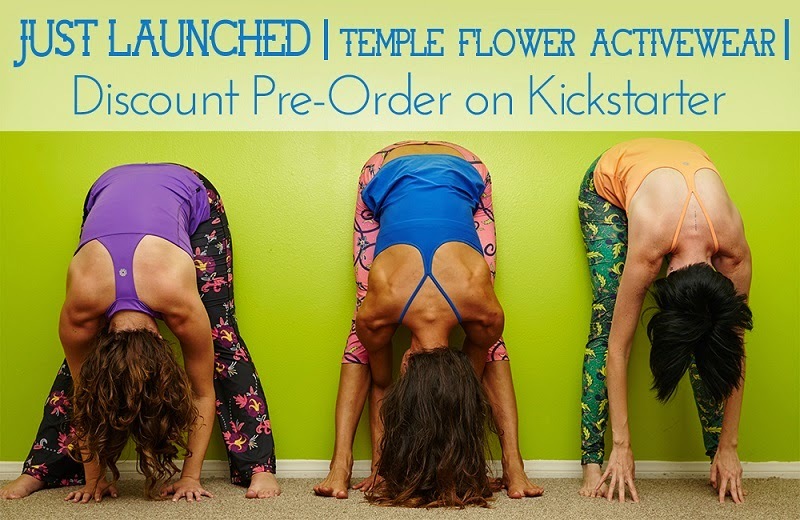 The Kickstarter campaign rewards include discounted prices on the instagram-favorite colorful leggings, crop pants, shirts decorated with the heart chakra along with bigger rewards including a yoga retreat in Malibu or a trip to India to visit our philanthropic partner, The Barefoot College. Follow their progress on Twitter, Facebook and Instagram!